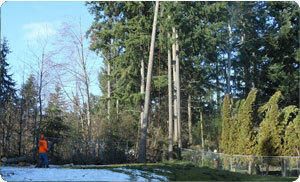 Now that winter is passing, it is time to get your Sumner landscape looking its best again. At Hunter Tree Service, we provide the best solutions for stump removal, stump grinding, and tree removal services in Sumner, WA. Our company was started by Jason and Paula Mahon in 1986 in Tacoma, Washington. 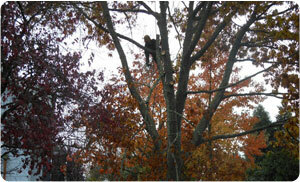 Jason Mahon is an ISA Certified Tree Climber Specialist while Paula Hunter-Mahon is an ISA Certified Arborist. Combining their knowledge, they created a family-owned and run stump removal, stump grinding, and tree removal services business that has earned the reputation of being one of the best in the whole of Sumner. Our company provides the safest methods for stump removal, stump grinding, and tree removal services in the Sumner and this is why many homeowners trust us to take care of their trees and maintain them as well. Our stump removal, stump grinding, and tree removal services are renowned among Sumner homeowners and we always make sure that gardens and yards in the city look their best without ugly stumps sticking out of the ground. Stump grinding is one of the most efficient and time-saving ways to remove unwanted and unattractive tree stumps in your garden or yard. Our company uses the latest technology and techniques for our stump removal, stump grinding, and tree removal services to make your Sumner landscape look beautiful once the unwanted trees and stumps are removed. We also use only the safest methods to make sure that no damage or injury occurs during the process of removing tree stumps from gardens. 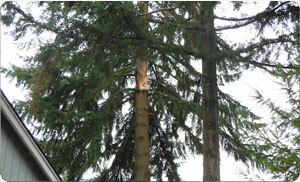 When it comes to stump removal, stump grinding, and tree removal services, we have one of the best teams of arborists. We employ only ISA certified arborists and tree climbers in our company to make sure that every job is handled by experts who have the skill and knowledge to properly complete all projects. Our arborists will always ensure the highest quality in stump removal, stump grinding, and tree removal services are provided to you for the care of your Sumner trees. For the best stump removal, stump grinding, and tree removal services, call us at 235.777.1938 today!